The Bro Bowl—an erstwhile icon of Tampa’s skateboarding scene—reopened last year with its spirit transposed to a graffiti-free imitation just a few hundred feet from its original footprint. While the skate park initially strained relations between the area’s skateboarders and the African American community—both made full-throated claims to the site—it seems that the new design has assuaged both sides. Planner Joel Jackson, a City of Tampa employee who seized on what was then a sub-cultural sport, was inspired by the informal use of swimming pools and designed the Bro Bowl in the mid-seventies. Built in 1978 as part of the Perry Harvey, Sr. Park, the Bro Bowl was among the first skate parks in the country. For the activists involved with brobowl.org, the demolition of the landmark in 2015 marked the loss of a cultural and social memory, especially considering that the move effectively revoked its historic status. Other activists claim that the site was significant not simply as a nostalgic moment in history, but as a public commons essential to resisting the commercialization of private skate parks. For some, however the removal of the Bro Bowl was a necessary part of a larger city-led effort to transform the Scrub neighborhood and Central Avenue drag. 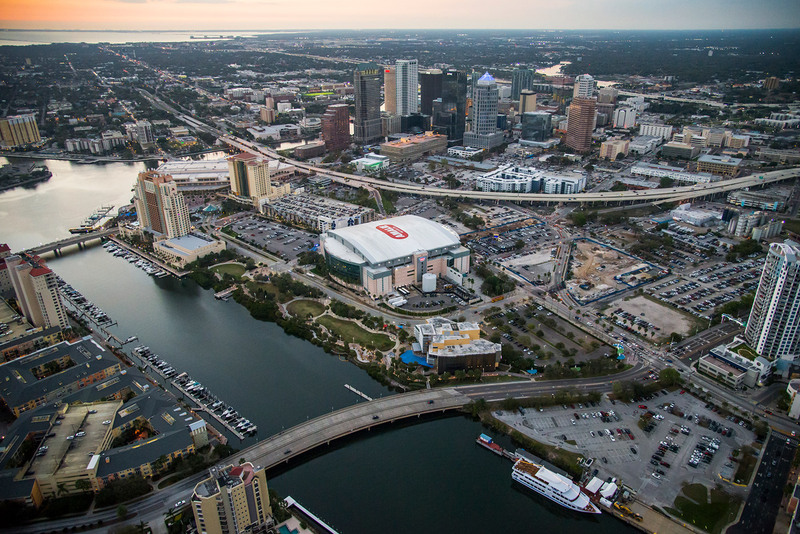 Many community leaders saw the redevelopment initiative as a method of reclaiming a bygone history of the African American experience in Tampa. The neighborhood has been occupied by African American families as far back as the Civil War, and has seen a growth of African American–owned businesses throughout the years. But under the auspices of urban renewal, some claim that much of this community was decentralized and even permanently lost. The redesign of Perry Harvey, Sr. Park and the investment in residential and commercial projects nearby was an attempt to realign the residents with the heart of their community. Tension between the two stakeholder groups has largely subsided in the wake of the park’s overwhelming success. The site of the former Bowl was replaced with a series of display apparatuses with imagery and text detailing prominent members of the African American community, both locally and nationally, as a kind of urban storytelling. Though the Bowl lacks the material history that was so beloved by the skateboarding world, small parts of the extant concrete surface remain in situ. The new skatepark was designed using laser-imaging technology to recreate the feel of the previous concrete surface. 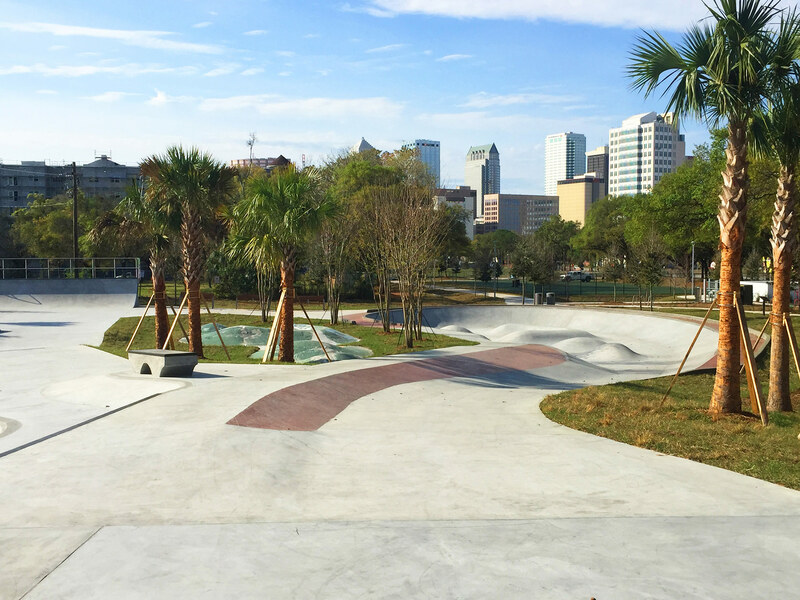 According to the Tampa Bay Times, local skateboarders are impressed by the similarities between the original and the replica, “They almost nailed it,” Brian Schaefer, Skatepark of Tampa founder, told the Times. 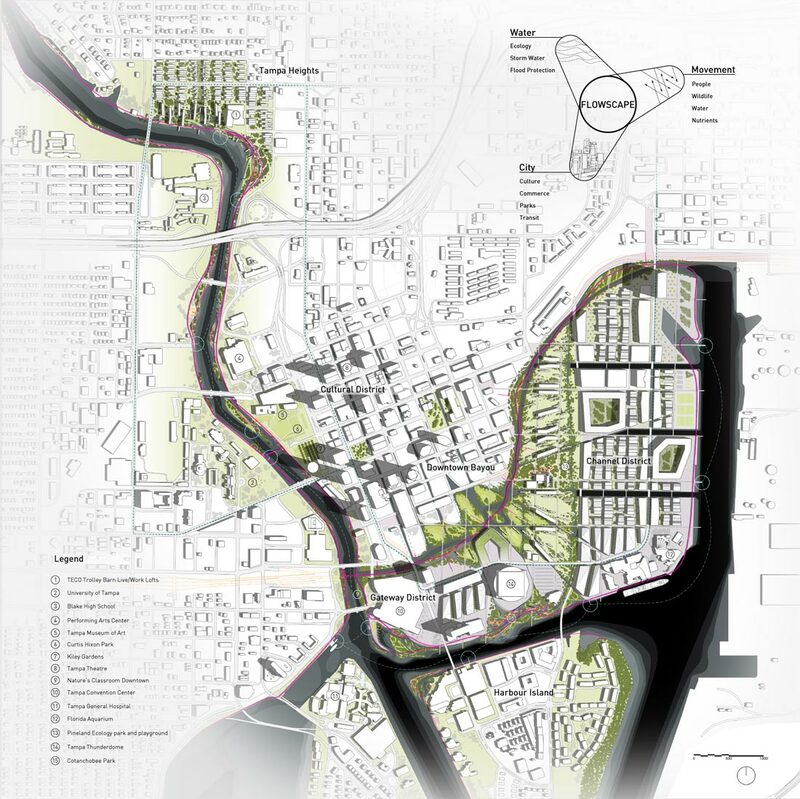 Will Maltzan’s “Lens” in St. Petersburg Be Too Murky? Last January, Florida welcomed Michael Maltzan Architecture’s stunning proposal for the St.Petersburg Pier, featuring a new tidal reef, a civic green, raised walking paths, a waterpark and many other attractions. Recently however, local marine scientists have concluded that the tidal reef element of the design is simply too good to be true, according to a report in the Tampa Bay Times. Named "The Lens," Maltzan's scheme calls for a figure-8 spatial organization, in which a loop provides a view into the clear water below. But Tampa Bay’s estuary waters are murky—not because of pollution but simply because of sediment—making the water too foggy for any kind of tidal viewing. Maltzan’s ideal emerald waters are expected to remain a fantasy, but scientist and architects are still trying to find others ways to provide an underwater view in the Lens. 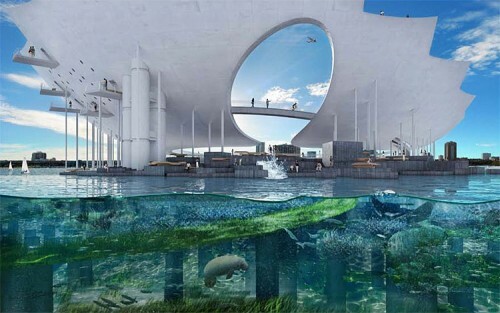 One of the proposals includes underwater technology that would enable visitors to see and hear marine life in the bay. Another includes elevating of the sea floor to create an inter-tidal area where birds and marine life could reside. Scientists, oceanographers, and environmental research teams are all working on the project, but many can’t help lamenting the lack of consultation before Maltzan's proposal was selected. "The Lens had flaws and those flaws are now unfortunately rearing their heads…What they presented, that PR bandwagon, went too far before the scientific brakes were applied," Albert Hine, of the University of South Florida's College of Marine Science, told the Tampa Bay Times. With a new and improved proposal due by October, Maltzan remains optimistic. He admitted that the Key West-like vision for the Lens is impossible, but believes that the reef element is not dead.